Any of the UK’s growing number of 4×4 pick-ups will happily tackle a trip away from the tarmac. Indeed most provide far more off-road performance than their owners will ever require. There are customers however, in a range of industry sectors, for whom standard tyres and ground clearance are simply not enough. They may only require additional performance a few times a year, or it could be every day, but every instance can be critical. That’s where specialist conversions, like Oberaigner’s 6×6 Sprinter, offer that extra bit of extra traction when it’s needed most. You don’t have to add an axle to get improved drive on the rough however, as the latest addition to Isuzu’s D-Max line-up proves. Built in association with Icelandic off-road specialist Arctic Trucks, the AT35 literally takes Isuzu’s humble pick-up to totally new heights. With revised springs, Fox Performance shocks and lifting blocks above the rear springs, the AT35 boasts a taller ride height than the standard truck. Add a massive set of Nokian 315/70 R17 rubber, that’s a 35′ tyre in old money, and its easy to see where the additional ground clearance comes from. How much higher? Ground clearance goes up to 290mm from 235mm on the standard D-Max 4×4, while the approach angle is now 36°, up from 30°. More impressively the ramp angle, the available peak between the two axles, goes from 22° to 32°. However, drivers should be aware that overall height also rises, to 1,930mm excluding roof rails, so they might want to think before heading into underground car parks. 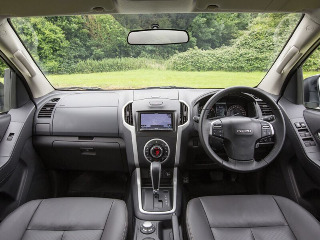 The AT35 is based on the high specification Utah version of Isuzu’s extended and double-cab D-Max, and the leather-clad interior is unchanged. The truck powered by the same twin-turbo 2.5-litre diesel engine with 163hp and 400Nm of torque. This can be paired with a six-speed manual in either model, with the increasingly popular five-speed auto transmission also offered in the double cab. Unlike many off-road conversions, that opt for aggressive mud-plugging tyres that are a complete headache on the road, the AT35’s Nokians are an all-terrain tyre, with a far finer tread pattern. This delivers very low ground pressure, especially at lower tyre pressures, and can minimise damage to sensitive terrain. Despite the width, the tyres are also reasonably quiet at motorway speeds, with very little tread block squirm on the road. Those striking wheelarches and liners are supplied by Arctic Trucks too, though the AT35 is converted in the UK from UK stock. The trucks also get a solid rear underrun bar, which provides a mounting point for a tow bar as the AT35 maintains the D-Max’s 3.5-tonne towing capability. You can also have a mounting on the front if desired, for mounting winches and other attachments. The AT35 conversion is covered by Isuzu’s standard five-year/125,000 mile warranty and service intervals remain at two years/12,000-miles. The extended cab model with manual gearbox has a CV OTR price of £30,000, rising to £33,499 for the double cab manual and a hefty £34,499 for the double cab with an automatic transmission. The AT35 looks the part and it delivers off-road, tackling the worst terrain with ease, without ruining the on-road ride. It’s an expensive option though.